A co-worker of mine recently told me about this savory casserole/pie made of chicken, cheese, and enchilada sauce baked over cornbread. This recipe is a hybrid of Pioneer woman's Corn casserole recipe and also The Tasty Kitchen's version of Tamale Pie. It will be a hit for the whole family! 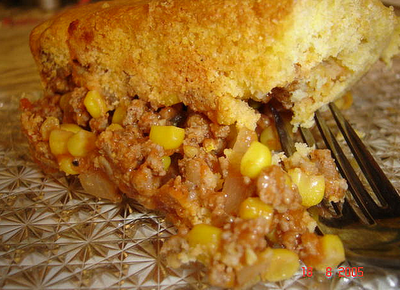 In a large bowl, combine the milk, egg, 1/2 tablespoon taco seasoning, cayenne, corn, corn muffin mix, and green chiles. Stir until just moistened. Pour mixture into a round pie plate (mine was glass) coated with cooking spray. While corn is baking, toss the cooked chicken in the remaining 1 tablespoon taco seasoning. Season with salt and pepper. When corn is done—it will be just barely set and golden brown—pierce entire surface liberally with a fork. Pour enchilada sauce over top. Top with chicken; sprinkle with cheese. Bake at 400°F for 15 minutes or until cheese melts. Remove from oven; let stand 5 minutes. Cut into 8 pieces; top each serving with cilantro. Hope you enjoy this delicious creation some night soon... I know I'll be!